3 mil (003):This 3 mil configuration offers more rigidity than light polypropylene films. Its glossy and dry-erase finish is ideal for write-on, wipe-off applications including posters, displays and more. Available with a Copolymer adhesive. Standard thickness polypropylene overlaminates feature a .5 mil base with 1 mil of adhesive. These glossy films give a “wet” look to prints for a clear and beautiful finish. 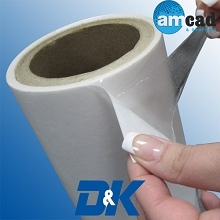 Available with a Copolymer, SuperStick , or SuperStick Digital adhesive. 5 mils of a clear solvent acrylic pressure sensitive adhesive is coated on a 60# release liner. This configuration offers added thickness for hard or irregular surfaces including glass, plastics and painted/coated metals. The adhesive is highly resistant to most environmental conditions including high and low temperatures and chemical exposure. 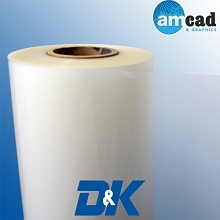 5 mil transfer adhesives are commonly used in applications including gaskets, labels, nameplates, and more.rd, etc. Polyester (PET) is a popular film choice with exceptional properties that makes it ideal for most applications. Polyester features excellent scuff and scratch resistance, durability, and folding characteristics. 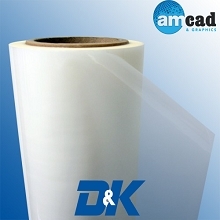 It also has high tensile, tear, and impact strength that is retained even after lamination. These films do not contain plasticizers or become brittle with age. Consider Polyester for projects requiring toughness, durability, and heat resistance.